Curiosity did not kill this cat! The bouquet hits you with peach, nectarine and woodsy cedar. First sip is crisp, fruity but not too sweet – what you would expect from a decent Pino Grigio. It finishes clean. As professed on the bottle, you get the hint of honeysuckle. Acid is nice and I think this is perfectly respectable – it won’t impress anyone and honestly I’ve tasted inexpensive Pinot Grigios that we’re better. There is a slightly tangy citrus aftertaste that lingers, but hey for $8.99, this is not so bad, it’s actually quite respectably drinkable. 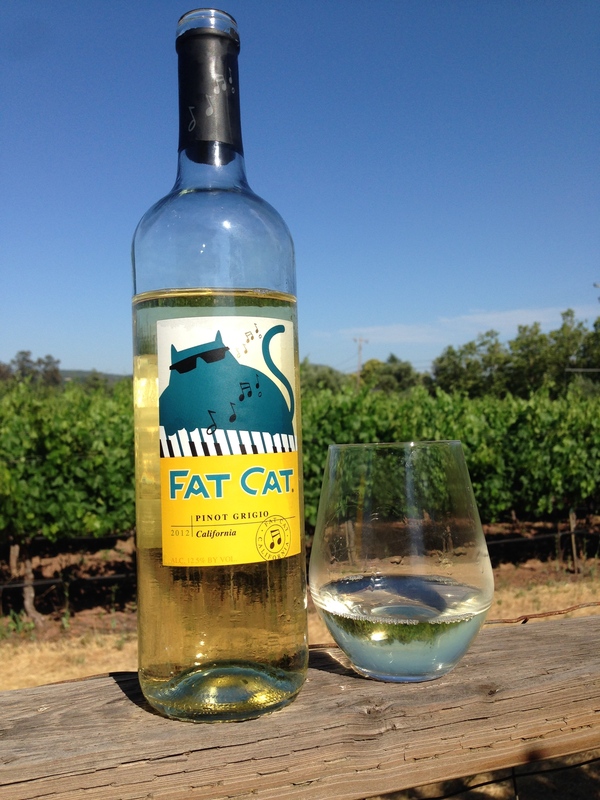 The cute jazz playing cat on the label will lure some cheapeaux winos to buy, where I’d normally pass, but net-net it’s a fun party wine. No one will fault you unless they are one of those insufferable types allergic to cats who aren’t fun at parties anyways. Include a lint brush and you have the perfect housewarming gift set for a cat lover. ← Wine Journaling – something to do w/used corks – that’s NOT an eyesore!